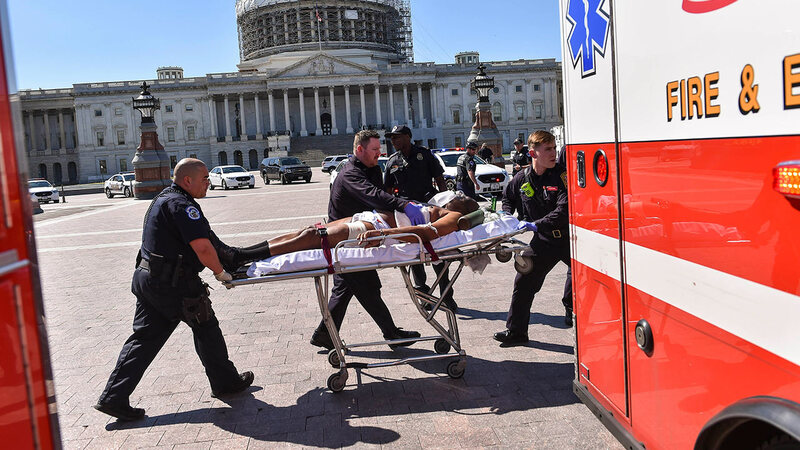 WASHINGTON -- The U.S. Capitol complex was set to return to normal Tuesday, a day after police say officers shot and wounded a man who pulled a weapon at a security checkpoint as he entered the underground Capitol Visitor Center. With last week's suicide attacks in Brussels, Belgium, that killed 35 people fresh on people's minds, Capitol Police Chief Matthew R. Verderosa held a brief news conference at which he preliminarily ruled out terrorism. The chief said he did not know how many officers had fired at the suspect. He also said no officers were injured, after initial erroneous reports that one had been hurt. Verderosa said a weapon he did not describe had been recovered at the scene and the suspect's vehicle had been found on the Capitol grounds and would be seized. Hours earlier, Supreme Court nominee Merrick Garland held two separate meetings with senators in a Senate office building across the street from the visitor center. The Capitol was on lockdown for about an hour Monday and the White House also was briefly locked down. Police officers, some with drawn automatic weapons, sealed off streets around the Capitol, emergency vehicles were lined up outside and staff members and visitors were rushed into offices and told to shelter in place. Cathryn Leff, of Temecula, California, in town for discussions with the California Association of Marriage and Family Therapists, said she was going through security at the main entrance to the Capitol Visitors Center when police told people to leave immediately. Outside, on the plaza just to the east of the Capitol, other officers told people assembled there to "get down behind this wall," she said. "I heard what sounded like two shots off to my left." After a while, police told her and others to keep running. "I felt like I was in a movie. It didn't feel real at all," she said. House Speaker Paul Ryan, R-Wis., issued a statement thanking Capitol Police, as did other congressional leaders. "This evening our thoughts and prayers are with all those who faced danger today," Ryan said.